If you enjoy cooking your own flat breads such as saj, naan, roti, manakish, gursaan and many others, then the NL-RM-1855 is the appliance for you. An electric dome-shaped bread maker with a non-stick 16 inch surface that can make any flatbread with ease. A variable temperature control thermostat allows you greater control over your cooking. such as saj, gursaan, roti, naan etc. 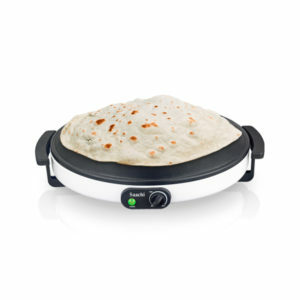 If you enjoy cooking your own flat breads such as saj, naan, roti, manakish, gursaan and many others, then the NL-RM-1856 is the appliance for you. An electric dome-shaped bread maker with a non-stick 18 inch surface that can make any flatbread with ease. A variable temperature control thermostat allows you greater control over your cooking.